I've always known I'm a particularly slow runner. Whenever other people talk about how slow they are, I still know I am considerably slower. "No, no!" they say. "Trust me, I'm, like, really slow." I nod in understanding, already aware of exactly what's coming next. "I run a 10-minute mile," they confess to me. I try and widen my eyes the appropriate amount. I'm not quite sure when the 10-minute mile became the slow runner's benchmark, but I can assure you I run significantly slower than that—typically whole minutes slower. For as long as I can remember, I never understood what the rush was when it came to running. In middle school, I joined the track team, which was my first introduction to running as a sport. I have a very distinct memory of lining up at the start during my first event, only to be hit by a terrible, unexpected realization: I could not care less who won this race. All around me, people were frog jumping and shaking out their limbs and practicing coming out of the blocks, and all I could think was, "Oh no oh no oh no. This is NOT for me." I felt certain I was missing a crucial athletic gene, and I wanted to stop all my fellow pint-sized runners and demand to know what was going on. Why did we all need to try and run faster than the other? Couldn't we just run? The best part about the running community is its inclusivity—all runners are welcome, no matter your background, experience, age, body type or, ahem, pace. Needless to say, I did not do well in track. This preference followed me into adulthood, from 5Ks to 10Ks to a recent bout of half-marathon training. As my coworkers crossed the 13.1 finish line rocking steady 8- to 9-minute mile paces, I humbly ambled along at just over 11. Afterwards, they compared their thoughts on course logistics and disappointments about time, and all I could think was, "I didn't even walk once! Not once, you guys!" It was a particularly positive experience, and it cemented that slow running, for me, was the way to go. But I'm not the only runner who fits this category, which is why this piece is to acknowledge my fellow slow-pokes. I know this site is filled with awesome, expert-approved tips for the striving athlete who wants to get faster, and maybe that's your thing—maybe it's not. But I think we can all agree the best part about the running community is its inclusivity—all runners are welcome, no matter your background, experience, age, body type or, ahem, pace. This piece is to simply say that I see you. I see you out there at races, more than happy in the back of the pack. I see you on long weekend runs, logging endless miles before most people even make it out of bed. In fact, I see you not tracking runs at all sometimes, because honestly, who the hell cares? The numbers can't capture the magic of a great run. I see you laughing at being passed by both sides of the age spectrum, from inhumanly fast 10-year-olds to inspiring 80-year-olds—and let's not forget the guy with the double stroller! I see you stopping for pictures on a particularly gorgeous run because no number of seconds lost compares to getting the perfect shot. 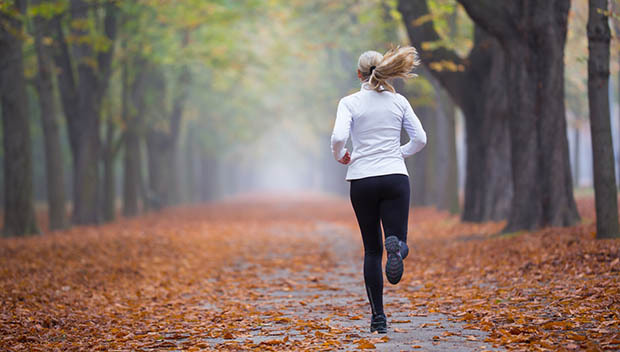 I see you running to maintain your health, to relieve your work stress, to show your kids the joy of movement or to quiet your anxiety with each pounding of the pavement. I see you not giving a you-know-what about having some unattainable "runner's body." I see you preferring long distances because though you may not go fast, you better believe you can go forever. I see you serving as honorary president of the, "Everyone is a runner!" fan club. I see you running for the sheer joy of it—and let's be real, some of the agony. I see you, slow runner, because I'm right there with you, and I'm almost certain no one is having more fun than us.